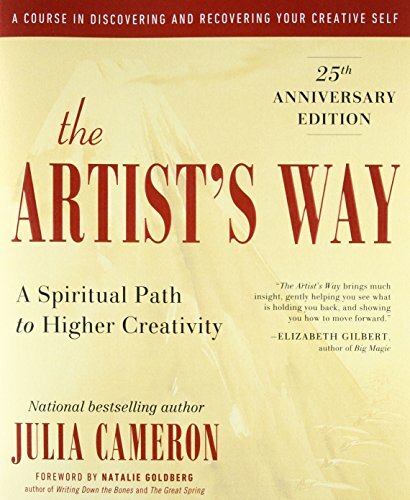 Going Deeper with the Artist's Way Course Coming up! Top 10 Reasons Why You Need To Take The Artist's Way Course with Me! Taking The Artist's Way course is transformative. I am ALL ABOUT TRANSFORMATION! I call my course, "Going Deeper withe The Artist's Way," because I offer coaching tools within the course. Traditionally, we take this course and it's a journey of self-exploration. We learn a ton about our creative selves. But as a coach leading you through the class, I'll be there to call you out when you're ready. I'll be there for a gentle nudge, to speak back to you the unspoken I hear come out of you. I'll be there to guide you intuitively so you get to take leaps forward with this course! This is a group thing -- always. You can read the book on your own. Or you can go through the class with a group to see what others get out of it and to get positive feedback on your own journey. The group holds you accountable and inspires you. 3. Sign up NOW and be the FIRST TEN to sign up and you'll receive a FREE coaching session immediately! Let's find out what you want to work on BEFORE the course begins! It will help you set an intention for the course and be clear as you step into the journey. 4. This is a program of recovery -- creative recovery. If anyone ever told you something you created sucked and you believed them, we're here to all get over that and heal together. Your confidence will rise. Your desire to create will return. You will realize you've been cheating on yourself by not creating. And you will stop doing that! 5. You will have new tools for your creativity arsenal. You will gain insight into yourself. You will have new ways to function creatively. The Morning Pages are an infamous tool used by people all over the world to help with creativity. I'm a true believer in them, though I don't do them daily. How about Artist Dates? When is the last time you took yourself on a date, all by yourself for at least two hours with no distractions? How has your "me time" been looking lately? If this answer is dismal, this course is for you! 6. This course is for everyone! It doesn't matter if you're a writer, painter, tailor, business person, actor, filmmaker, dancer, etc. This course is for those who create. This course is especially for those who DO NOT. We will address that, yes, you truly are a creative soul. We all are. We will also address why you haven't been creating to your full potential. I took this course once with a group of writers. That was fantastic for me as I am a writer. I believe you can get something out of this course whether you are George Lucas or a high school student. It doesn't matter if you are a stay-at-home parent, jet-set business deals maker, a construction worker, a musician, or college student. This course isn't about what kind of creative you are or what you do for a living. It's about freeing yourself through creativity. We all are endowed with creativity. 7. Creativity is our God-given right! The world needs our creativity. Not only do you cheat yourself by not flexing your creative muscle -- you cheat the world. 8. There will be this course for an hour a week. Plus coaching sessions available at deep discount to my students enrolled in the course! You don't have to do extra coaching in addition to the course if you don't want to. But during the course, I will drop my coaching prices to those "Going Deeper with the Artist's Way" students who want to really do the work! 9. This course is about self-care. If you've been wanting to get better at this, now is the time and this is just the project you need to embark on. Self-care is mandatory in The Artist's Way course. I've been a self-care advocate for years, which is why I named my Reiki business in Wichita, "You Deserve Reiki!" 10. You're resisting this course, aren't you? To quote the course/book author, Julia Cameron, "Just remember, in choosing, that we often resist what we most need." I love what this course did for me, which is why I now lead it and offer it. It's going to give us coaching promtps I can coach you around if you so dare. So don't resist. Do it! It will be fun and you will grow! But mostly, we will have FUN! This class will be held in a weekly live webinar on LearnItLive.com (Flash required). You don't have to video chat with us unless you want to -- you can just view the class and participate via chat. As your teacher, I will be available constantly through the 12-week course. You can reach me via email, video conference, phone, or coaching sessions. I will offer one-on-one private coaching sessions outside the course at deep discount! You can do all of this from wherever you are in the world, as long as you have Internet.